Darrin and Liana Michael of Piqua introduce their daughter, Harper, 2, to a live reindeer at Piqua’s Christmas on the Green on Friday. The Piqua High School show choir, The Company, performs during Christmas on the Green in downtown Piqua on Friday. PIQUA — The 27th annual Christmas on the Green celebration kicked off with a performance from the Piqua High School show choir, The Company, outside of the Piqua Public Library on Friday evening. “We had a great crowd for the Piqua High School show choir,” Lorna Swisher, executive director of Mainstreet Piqua, said. 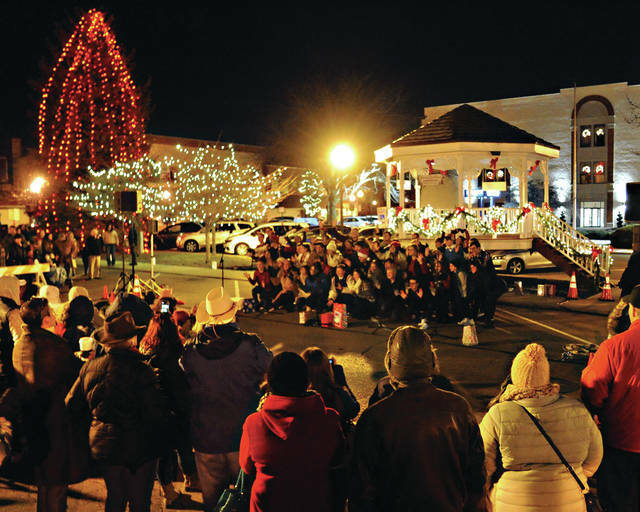 Christmas on the Green is based on the French family tradition of caroling in the Piqua-Caldwell Historic District, and The Company continued that tradition by leading a sing-along of holiday songs after their initial performances. The singing group Voices Alive from the Sidney Christian Academy followed The Company’s performances. Swisher also thanked the French Foundation for their support of the event after the Voices Alive performance. Nearby, a live reindeer drew the interest of many attendees. 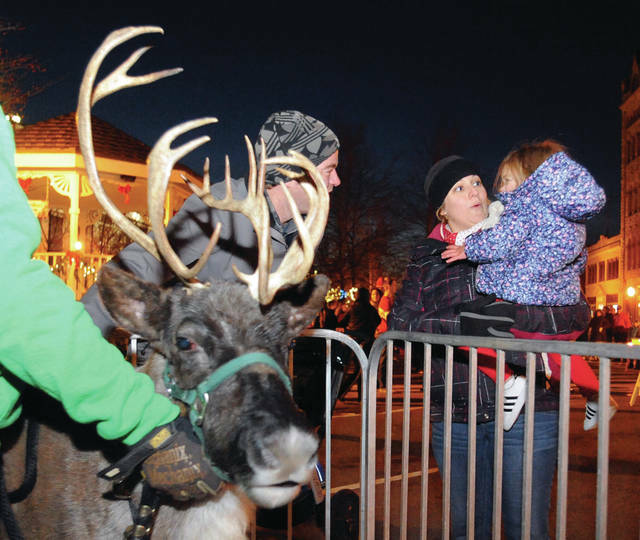 This was the first year that a live reindeer was featured during Christmas on the Green. “We’re so excited to bring reindeer to the downtown,” Swisher said. Inside the library, Christmas and holiday displays greeted visitors. “Our big thing is Santa,” Jim Oda, director of the Piqua Public Library, said about the library’s decorations and displays. He added that the library has a mid-17th century icon of St. Nicholas a part of their Christmas displays. “We keep growing with toy soldiers,” Oda said. Christmas trees are also featured this year at the library. In addition to their large Christmas tree downstairs, the library has eight Christmas trees on display in their gallery on the second floor. Those trees were decorated by various local organizations and businesses. Christmas on the Green was also a night for families, as there were activities for kids dispersed throughout the downtown, including games in the children’s department inside of the library, the Kiddie Christmas Shop inside Mainstreet Piqua, and Mr. Twister making balloon animals inside Readmore’s Hallmark. Mainstreet Piqua also introduced “Giant Reindeer Games,” with large-size games such as checkers, Connect Four, dominoes,Yahtzee, and tic-tac-toe inside Stonebridge Community Church on Greene Street. Some of the visitors to the downtown included Rachel and Lance Hughes of Greenville, who kicked off their time at Christmas on the Green with a ride on the horse-drawn carriage with their daughter, Henley, who is 19 months old. “This is our first year,” Rachel Hughes said. Over on the 400 block of Main Street, ice sculptor Ramon Rodriguez of Dayton created an angel, snowmen, and a reindeer during his 10th year ice sculpting during Christmas on the Green. The sculptures were made out of 150-pound blocks of ice. Rodriguez has been creating ice sculptures for 36 years, and he creates approximately 500 a year. He also teaches ice sculpting at Sinclair Community College. Strolling characters also returned to Christmas on the Green, along with a photo booth and a brass band performing outside of Barclay’s Men-Women Clothiers. Two new businesses — the Blue Bow Boutique and This & That’s Candy on Main — also held their grand openings on Friday, remaining open through Christmas on the Green like other businesses in the downtown.